long-time on Esty Street in Ithaca (another cousin still lives in the house). Their legacy to-date: 6 children, 22 grandchildren, 48 great grandchildren, 48 great great grandchildren and 9 great great great grandchildren. I enjoy hearing my uncle, aunt and mom telling stories of growing in Ithaca and their experiences in the 1920's, 1930's and 1940's. May your family celebrate its generations. The History Center's April 6th kick-off to our 2016 Generation to Generation series promises to be both fun and meaningful. What would it mean to tell your story? How might the experience change you? How might it enrich others? What would it mean to have this exchange across cultures and generations - between parents and children, the middle folks, and the elders? In those intergenerational spaces lie insightful lessons about life, love, defeat, and transformation. These are meaningful stories that inform and entertain. On April 6, prepare to delight in the human experience. Join us for a memorable evening with Paula Younger, story practitioner and founder of pancakemoments™, as she shares her thoughts on the distinctive power of pancakes and their connection to the wonder narratives that lie within all of us. Come enjoy a variety of delicious pancakes, from crêpes to arepas, provided by the Carriage House Cafe, Coltivare, Purity Ice Cream, ¡Bici- Cocina!, and Kendal at Ithaca. Click here to visit The History Center's website for more information. By attending this event, you will be supporting The History Center's GENERATION TO GENERATION series. Over the course of seven months, this series will provide an intentional focus on intergenerational connections. Oral history and genealogy training sessions, an intergenerational program on "Collecting and Sharing Stories through Maps and Photographs," a collaboration with the Dorothy Cotton Institute that will seek to build connections of those involved with social change within and across generations, exhibitions that encourage conversations across the life span, Eight Square Schoolhouse events, and heritage tours are a few key programs and events that make up this series. The History Center's "Generation to Generation" tag line resonates with our mission statement, and is a central theme in our education and research center initiatives. This GENERATION TO GENERATION series is an invitation to all of you to reflect on your place in this community, and your interactions and connections with multiple generations. Tickets are $46/person for this 4/ 6 event. Ticket sales end on April 2nd. You can purchase your ticket at The History Center (401 E. State St., Suite 100), over the phone with a credit card (607-273-8284 x 227) or from a History Center trustee. Sol Goldberg's photos capture the lively doings of youngsters and adults in his Upstate new York home town - at play, at work, in fun, in serious moments. For the decade 1956 to 1965 when Goldberg was staff photographer for the Ithaca Journal, his award-winning pictures brought humor, drama - even make-believe - to photojournalism. One hundred of these images make Kids an entertaining and revealing look into a gentler period in the life of one community. Get 15% off this book when you mention this newsletter! In Memoriam: Cemeteries of Tompkins County dry-mounted images for sale. Directly from the exhibition, these large and small images, in gray scale and color, are of a variety of cemeteries, tombstones, and more found throughout the county! Play is as natural to us as breathing. We begin playing with our first sight of a smiling face and wiggling fingers, and keep at it long after we are old enough to become parents and grandparents ourselves. Toys and games enhance our play, making it richer and more complex. This interactive exhibition features some of the many toys and games from The History Center's collections. Modern examples meant for hands-on exploration will accompany the artifacts to be featured. Photographs from the Sol Goldberg Collection will be on display as well, highlighting his whimsical portrayal of local people in their playful moments. This exhibition will examine the way play has changed - and stayed the same - over the years. It is a celebration of play and childhood, for the child in all of us. This display case is a collaborative effort between The History Center and the municipal historians of Tompkins County. Currently on display is a history of the Cargill Rock Salt Mine in Lansing. Content loaned by Louise Bement, Town of Lansing Historian. The Friends of Robert H. Treman State Park will be holding their annual meeting at The History Center. Stop in for updates from the park as well as a presentation by Tony Ingraham titled "The Changing Face of Taughannock Falls." First Friday Gallery Night - Exhibition Opening! Join us between 5:00 and 8:00 PM for the grand opening of Come Play With Us: Early Toys from the Collection. Tour the gallery and discover historic toys from our collection and explore our modern toys ready for play. View images of photographer Sol Goldberg featuring his whimsical portrayal of local people in their playful moments. Light refreshments will be served. Join us at Kendal for The History Center's spring fundraiser! Enjoy a presentation by Paula Younger on pancakemoments™ and delight in variations on pancakes, from crêpes to arepas, provided by the Carriage House Cafe, Coltivare, Purity Ice Cream, ¡Bici-Cocina!, and Kendal at Ithaca. Tickets $46 for this 4/6 event! See more details above or visit the Encouraging Connections webpage. In its entirety, the Ithaca Fringe Festival will have seven acts at five venues this year! Join us at The History Center for the act A Night to Towanda. In this sequel to their award-winning "Road to Towanda" the hapless crew of Flower City Vaudeville arrives in Towanda to premiere their brand new show - new acts, new comedy, new shenanigans. Unfortunately when their truck broke down they left most of their props behind. But wait! The custodian at the American Legion Hall promises he can round up everything they need before the curtain goes up. Bursting into the Legion Hall with thumbs chaffed from hitchhiking, they hear... "Ladies and gentlemen, please welcome Flower City Vaudeville!" This thought-provoking presentation, with the exhibit "Come Play With Us" as a backdrop, will cover the importance of play in childhood development and on early education, the importance of free play for development, the impact of technology on playful exploration during adolescence, the reluctance of adults to play and how this impacts their well-being and the impact of retirement on older adults and how the process of aging can impact a person's ability to play. The presenters will bring rich experience, research, and practical application to the program. There will be an interactive component as participants will have the opportunity to identify meaningful activity that they are or have been engaged in across the lifespan. A teacher at the Cornell Child Care Center since 2009; attended SUNY Empire and received her degree in Human Services and then a Master's in Early Education. A teacher at the Cornell Child Care Center since 2010; attended Ithaca College and received her degree in Sociology with a concentration in early education. Associate Professor and Chair, Recreation Therapy Clinical Supervisor at the Center for Life Skills at Longview, Department of Recreation and Leisure Studies Ithaca College. Beginning in 1961, Gould Colman enlisted memory to document human interests and activities. Subsequently, wide ranging subjects were investigated in cooperation with Cornell faculty members, graduate students and others, mostly in New York State but many times farther afield. Nearly a thousand tape recorded conversations are being preserved as audio records and transcripts (one project having generated over 20,000 pages) in the Cornell Library's Rare Book and Manuscript Division. At this event Dr. Colman will discuss oral history practices and possibilities and respond to audience questions such as: Why do you avoid the word "Interview?" Whose assistance proved the most valuable to you? What was your biggest mistake? Is your child interested in history? Consider sending them back in time to The History Center's Eight Square Schoolhouse week long living-history summer camp, Digging Into Carrie's Diary. Nineteenth century activities based on the 1869 diary of Carrie Manning, a local thirteen year old from the Town of Ithaca with an emphasis on period foods, herb gardening, sewing & textiles, genealogy, nature walk, music, art, period games and journaling. Each day will also focus on Eight Square archaeology, specifically as it relates to the daily theme. Children will be able to excavate on site with a local archaeologist leading the dig! There are currently no scholarships available for the camp. There will be no supervision of children before and after the camp. As much as The History Center strives to be accessible to all, our 19th century Eight Square Schoolhouse is not accommodated for the handicapped and disabled. It is generally believed that Carrie's family farm, cleared in the early 1800's by her grandfather, was where East Hill school currently stands (on Winthrop Drive) and the one room school she attended is now a dentist's office on Triphammer Road. The topics above are the ones that our camp days will revolve around. We believe that the archaeology component we are adding to the camp helps to flesh out the reality of what life was like for students and children in the 19 th century, and also lends a unique and unexpected component to the camp. Of course being on the Eight Square site itself is also a unique component to this camp! The last hour of every day will be spent tying in the day's activities to what could potentially be found on the site by archaeologists, and what the children might potentially find as they dig on the site. Carrie died on January 1, 1875, when she was 19 years old, most likely of consumption. She is buried in Pleasant Grove Cemetery near Community Corners. Her mother died 6 years later and was buried next to Carrie. After her death, Carrie's sister Mary kept the diary, and when Mary died in 1898 it went to her daughter Ruth. Just before she died in 1955, Ruth gave the diary to William Heidt, Jr. who edited and published the diary in 1956, with the intention of making it available to students in local schools. The copy of the abridged diary that each student will receive during this camp is from the fourth printing. 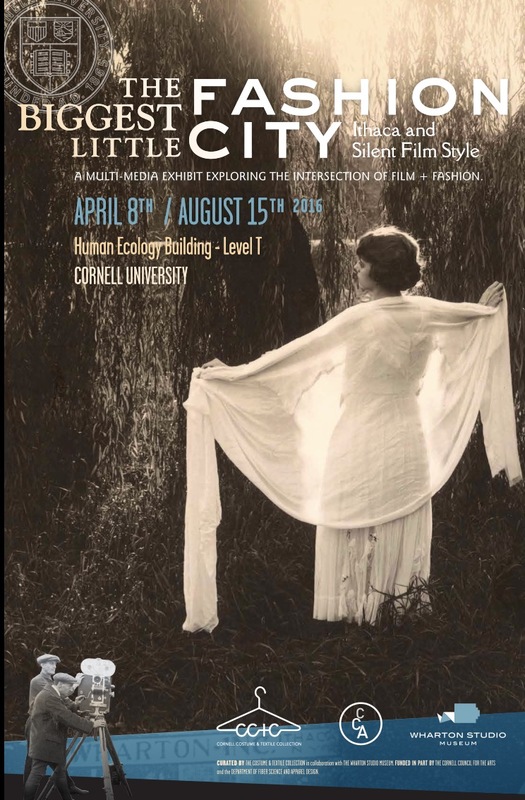 Wharton Studio Museum is excited to be collaborating on this multimedia exhibit on fashion of the silent film era curated by Cornell's Costume & Textile Collection and the Dept. of Fiber Science & Apparel Design. The exhibit focuses on international film star, dancer and fashion designer Irene Castle and features original pieces of clothing worn by Castle along with a WSM-produced display about the historic Wharton Studio. Fire is the greatest foe that has alarmed mankind for centuries. In early England, people turned to the fire extinguisher grenade, which was a bottle made of thin and fragile glass designed to be thrown on a fire, breaking easily in order to spew its contents to quench the flames. Because of this unique use, the grenades were designed to be light and easily handled. These grenades could be found in homes, hotels, factories, schools, trains and other commercial buildings around the turn of the 20 th century. This glass bottle has a tightly stopped opening and contains a carbon tetrachloride solution. Standing 6 inches tall with its round body 3.5 inches in diameter, the bottle pictured is a great example of talented glass blowers. Manufactured by Harden's Hand Grenade, this extinguisher would have been used circa 1871 to 1883. The fire grenade works by robbing the fire of its oxygen. Various fluids were tested in the grenade and the most effective one discovered was carbon tetrachloride. In more recent years, it has been found that this chemical, when inhaled, can cause many respiratory problems. The liquid was then changed to salt water in most cases. Made in many colors and unique shapes, most grenades are embossed with the name of the manufacturer such as Harden's, Hayward's, Babcock, Harkness, Little Giant, and Cornet, to name a few. These beautiful and useful glass products were gradually replaced by the metal fire extinguisher we know today. Even though the glass fire grenades were made to be broken and destroyed, there are enough examples remaining in very old homes and historic commercial buildings to attract great interest in this bit of history.